Third grade artists learned about Norval Morrisseau, a Canadian aboriginal artist. 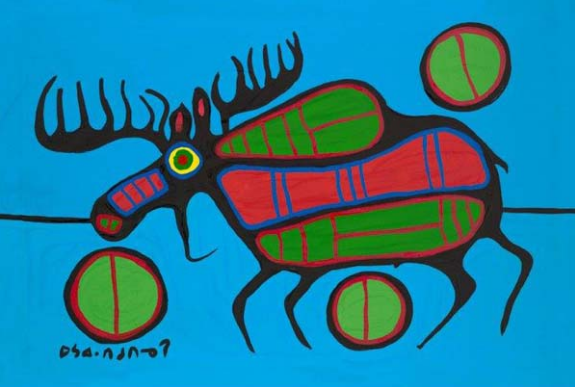 After looking at Morrisseau's work and learning a bit about his life, we discussed spirit animals. We chose our own spirit animal based on the animal's qualities (strength, cunning, speed, grace, etc). Some kids chose real animals, others chose to make up their own animals. We sketched animals using simple shapes (I always make sure to have lots of pictures of animals for reference). Students chose an animal to draw on colored card stock. We painted our spirit animals with tempera and outlined them with black sharpies. After mounting them on black paper, students came up with titles for their artwork.